I'm sorry but I need to close this guest book due to the General Data Protection Regulation effective in Europe as of May 25th, 2018. I found an interesting looking, but pretty bedraggled looking, skipper on my favorite secondhand barbiewebshop. thanks to your great website I managed to determine her as a California skipper and purchased her with almost all of her accessories, yay! After a thorough cleanup ( paint and penstripes on her body, hair relatively good) I now have a beautiful new doll. If you want pictures of her with hr thingies, just give a yell. Then later I bought me a doll whom i thought might be a funtime skipper, she wasn't though. Clearly a tanned skipper ( so much for photographps..) marked Mattel, Inc. 1967 Philippines. so I went to your website and think she's a beachfun skipper and in mint condition too, without her OSS though. But what i found remarkable ( being relatively new at gathering those dolls) is that her head is massive and smaller than the usual skipper. Her body is beautiful too, most of these modern skippers have a very visible line on the legs, this line is nearly invisible on this one. Like on the older bendleg skippers. Now I do wonder about her origins, would you have a look at her? I want to publicly thank Emily- I emailed her witha question & she replied with the information. Thank you. Keep up the wonderful work Emily. Dear Jane, yes, Sandy is marked like that. This reminds me to add the markings to my webpage :-) Thanks so much for your feedback! I will be adding a webpage on Francie dolls in the future. Thanks to everybody who commented below for your lovely feedback and for liking my page! I hope to be able to add some more updates soon. What a wonderful website, without doubt the best on skipper that I have found. Thanks for sharing all your knowledge and pictures of your beautiful dolls. Just found your site and bookmarked it for the future! I got here because I recently purchased a Skipper clone that is marked "Unique 1965" on the back of the neck. Have you ever heard of this doll. She looks just like the Elite Sandy doll. Also do you have information on other type Barbie dolls? Awesome site!!! I refer to it often, Thank You so much for taking the time to do this. I know it's a lot of hard work so I just want you to know we do appreciate you! Thank you for this site Emily! OMG! It has amazing information. Please put it into book form. Thanks so much, Barb - it's people like you that make this webpage worthwhile :-) I'm glad you like my page! LOVE, LOVE this site! Kudos to you for showing your passion to others! Thank you for your kind comments, monalisa and Fiona - I hope to be able to spend more time on this webpage in the near future - there's so many great new info to share! your japanese skipper are georgeous! I simply LOVE this site! Every time I come here I find out or see something new. Congratulations on a wonderful project. I want to thank you all for your nice comments - I'm happy you like my page! Unfortunately I've been very busy lately and didn't have time for updates, but there's a lot of new information and pics to be added in the near future which I hope you'll enjoy. This Website is amazing. I love it. I think you should write a book! The information you give about skipper is so fantastic and goes much deeper than the book you are giving as a reference. Such a well done and informative site. It has given me even more passion for my obsession with this beautiful doll. Thank you for all the hard work you have put into making this site so great, Emily. Thank so much for this site. I especially enjoyed the information on the Japanese Skipper dolls. I haven't found so many detailed info on this subject before on any other site/in any other book. This is my favorite site on Skipper dolls! This is great! Very well done. Love the photos and info. I don't agree Skipper was a teenager. My opinion: about 9 or 10. Skipper arrived in my life 1964; I was 9. I dressed the same way. Hats, anklets, peddle pushers, full skirted dresses, all apropos for that era. Great page with great info and wonderful photographs. Found some information I've been looking for for a long time ... Thank you! I have never seen the Skipper key chain before, until now. Adorable!! Very well done!!! I'm so proud of you! Love this site!! Keep up the great work!!!! Love this site! !very very well done!!EXCELLENT!! Hi. I enjoyed seeing your lovely Skippers. 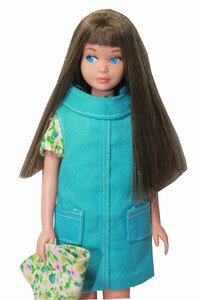 She was my first fashion doll, my sister got Barbie. Mom said Skipper looked like me. I wish you could have something on her friends, Skooter and Ricky, I have only found Skooter with very played with condition. Thanks for sharing your dolls with us. Congratulations on this really fabulous site! I simply love it! All the things I didn't know!!! I will definitly stay tuned! !!! Thanks! Will be checking back. Great info about Skipper! Very helpful and useful. Especially like the hair color section with all the details. Will be checking back often! Just loved your site for Skipper. Great learning tool. Thanks for doing this. Looking forward to even more info. Nice pix. Enjoyed your site so much! Saving for reference! I LOVE THIS!!! For some reason I've always loved Skipper the most but I thought I was the only one!